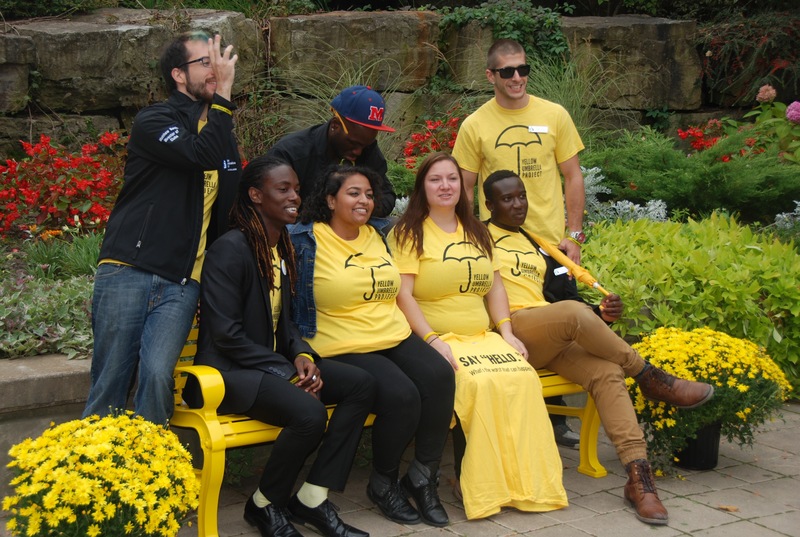 The Lucas Fiorella Friendship Bench unveiled its iconic yellow bench and #YellowIsForHello student mental health campaign at Niagara College this week, which makes it the first of its kind dedicated to a Canadian college. We’re thrilled to add Niagara College to these firsts. In the months and year ahead this program will be unveiled at other Canadian colleges including Humber College and Centennial College. 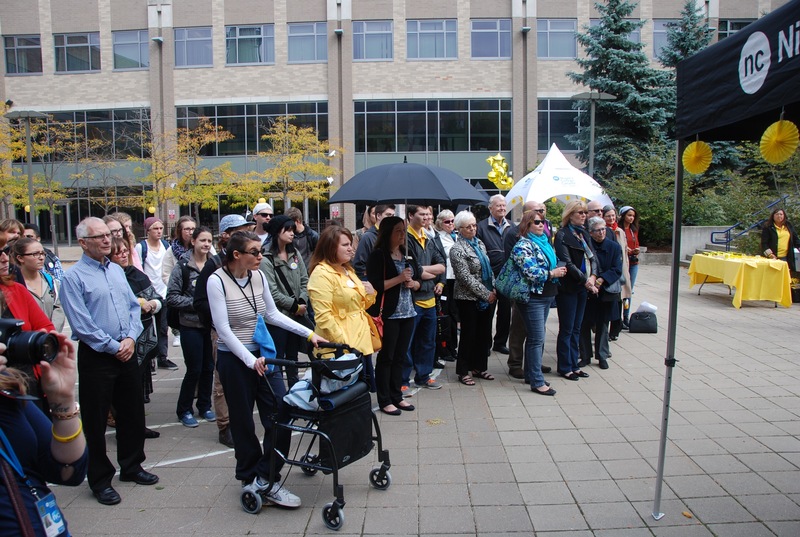 Students and faculty gathered for The Friendship Bench unveiling at Niagara College’s main campus. 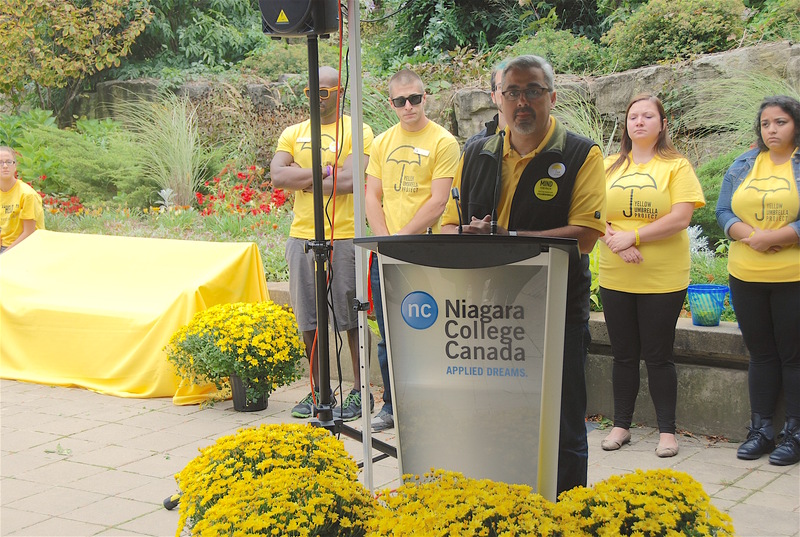 Sam Fiorella dedicates The Friendship Bench to Niagara College in tribute to Tyler Santing. Shane Malcolm, President of the Student Council shares some inspiration before the dedication. Rick and Sharon Santing unveil The Friendship Bench. 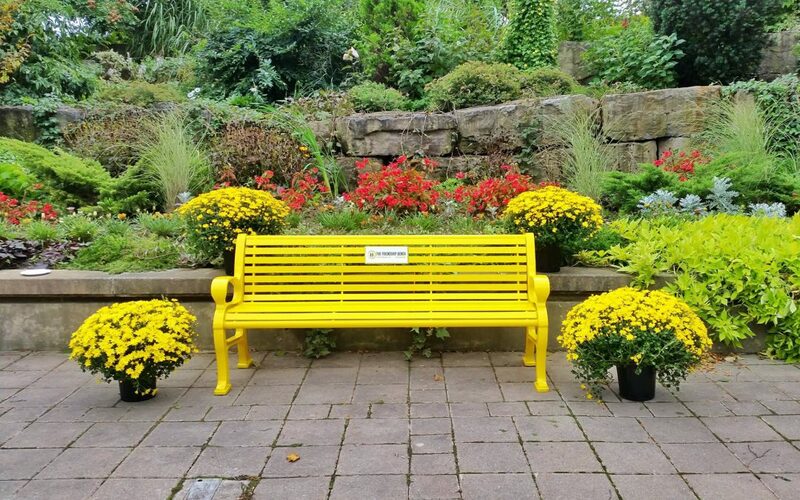 This first Friendship Bench to be dedicated to a Canadian college was donated in tribute to Tyler Santing, a student at Niagara College who died by suicide a year ago. 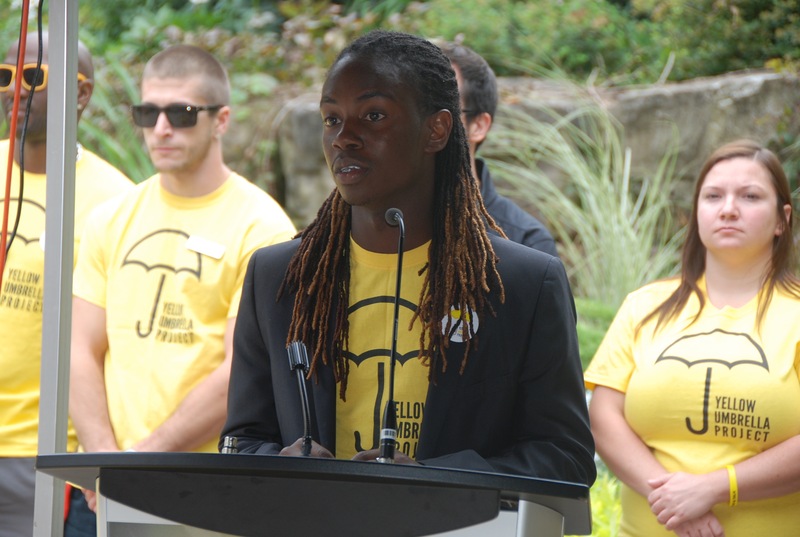 Tyler’s family and friends spearheaded a fundraising campaign in order to provide the college with a permanent and positive reminder that mental health is an important topic of discussion for students and something to be constantly vigilant of. Read more about Tyler’s tribute here. The college provided a buffet lunch for all those in attendance in hopes that the conversation started during the unveiling would continue. Students took the opportunity to chat with friends, make new friends, and connect with the college’s mental health counsellors who were all on site for the event. Students were eager to sit on the bench after the dedication. 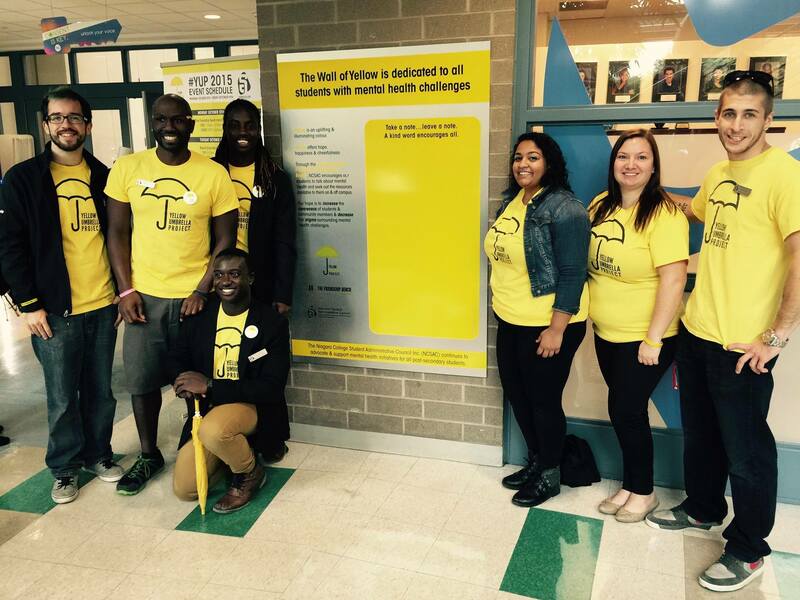 The Student Government surprised us all by unveiling a special addition to the college’s mental health awareness effort: The Yellow Wall! This wall plaque was created to encourage students to leave and take message of hope, love, and support. Students who wish to leave positive messages to their peers can do so by adding a Post-It Note with the message on the wall. Students are free to browse the messages and take one if one speaks to them. This exchange and dialogue is exactly what The Lucas Fiorella Friendship Bench hopes to inspire! The Wall of Yellow, inspiring peer-to-peer conversation and support. Thank you Niagara College for allowing us to join your community. Special thanks to the Santing family for making this possible in memory of your tremendous Tyler. 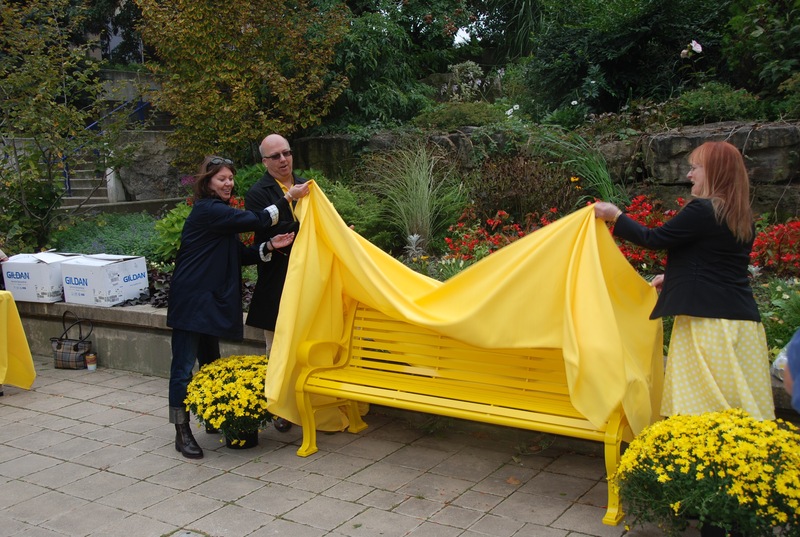 Join our mailing list to receive the latest news and updates about The Friendship Bench and #YellowIsForHello, including bench launches, special events, new schools, local fundraising and more.